Karen Woodward: The Structure of a Great Story: How to Write a Suspenseful Tale! 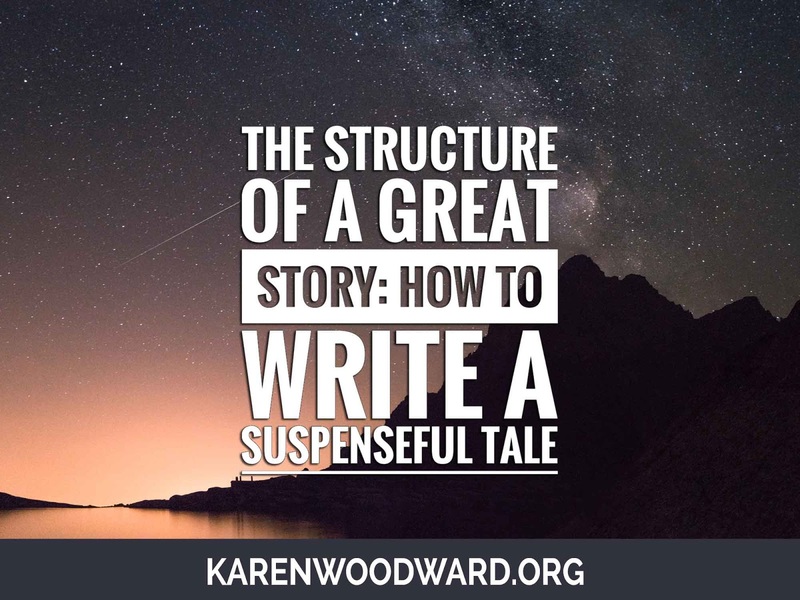 The Structure of a Great Story: How to Write a Suspenseful Tale! I did it!! Finally! 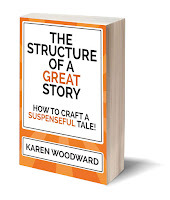 I just finished the book I’ve wanted to write for YEARS: The Structure of a Great Story: How to Write a Suspenseful Tale! If you’ve read my blog for awhile you know my personal story. Ever since I can remember I’ve wanted to know what makes one story unputdownable and another a cure for insomnia. I’m sure this could be several things—including the author’s writing style! But often the difference is that one story has the right meter, the right patterns, a natural rise and fall of action and inaction, of taking chances and facing consequences, while the other doesn’t. That said, I’ve read books and watched movies where what should have been a gripping tale left me cold. Also, stories that made NO sense in terms of how they were structured ended up being highly entertaining. I want to stress that there is no guarantee any particular story one writes will be interesting to any other particular person. Just like I can chat with two different people at a party and they each come away with wildly different opinions of me, so a story can make wildly different impressions on any one reader. Given this it’s obvious there’s no such thing as ONE structure, or set of structures, that is guaranteed to make a story enjoyable for everyone. But even so, even admitting this, there are certain rules of thumb that can make any story more suspenseful and easier to read. That’s the sort of thing I’ve been interested in learning, in documenting. It’s time for me to stop rambling on about the book and present you with an excerpt! Although there's no secret formula that will generate a best selling story, I believe that often repeated saying: knowledge is power. In this case, knowledge of the craft of writing. This knowledge gives us the power to change, the power to improve. But knowledge only goes so far; it has to be paired with practice. The stories I focus on in the following pages are often called genre stories. They're stories filled with suspense, the kind that keep decent hardworking folk up till indecent hours, unable to put their book down until they discover what happened, whether the hero found the treasure and saved the day or lost everything in a fiery inferno of regret. I don't claim to know everything about writing and this slim volume does not contain the sum total of writing wisdom, far from it. I started blogging about writing in 2010 because I believed that, as Seneca wrote, "by teaching we are learning." This book grew from that quest. 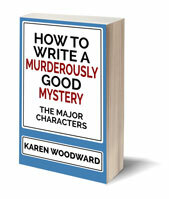 I believe the key to writing good genre fiction is to create complex, compelling, characters, put them in an interesting yet hostile setting, introduce believable opposition with clear stakes, and wrap it all up in a well thought-out plot. In other words, the key to writing great genre fiction is to write a great story. If you would like a free copy of my book in return for your opinion of it please contact me at karen@karenwoodward.org. Thanks! Today I'm recommending Creating Unforgettable Characters, by Linda Seger. Dr. Linda Seger has worked on over 2,000 scripts! She even worked with Ray Bradbury. Yes, this book focuses on screenplays as opposed to novels, but it contains a lot of good information. That's it! I'll talk to you again on Monday, I hope you have a great weekend. In the meantime, good writing! Labels: #amwriting, #writing, rules of writing, story structure, The Structure of a Great Story: How to Write a Suspenseful Tale!